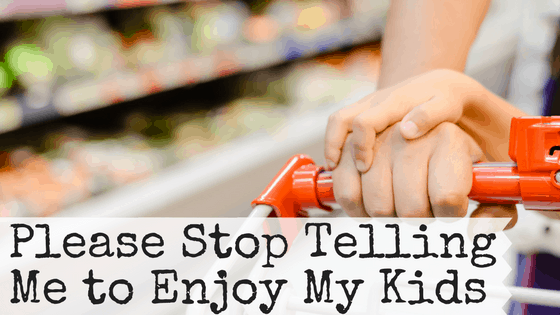 Please stop telling me to enjoy my kids. I know that I look frazzled and angry and on the verge of crying while I drag two shopping carts filled with kids and groceries around the store. I know that I just spoke to my child in a harsh tone when they asked for a cookie for the 173rd time in the last five minutes. I know that your intentions are good. You probably think that you can tell me how quickly they grow up and how much you miss your kids being little, and I’ll immediately have a paradigm shift that enables me to be a joyous Walmart shopper. Maybe you think that your little quip will make me start a fun game where we pretend the store is Candy Land. Then, my kids and I will giggle and hop our way from the Peppermint Forest to the Candy Castle scooping up groceries along the way. But I’d like to challenge the very premise your advice is based on. Do you really miss your kids being little? Do you miss the nights of being woken up every few hours by different kids who are thirsty or have a wet diaper or need to pee or who scream your name over and over in the night because they need you to put their thumb down?? Do you miss the bone-aching exhaustion of realizing it’s already morning because the kids are up and screaming for YOU? Do you really miss the days that all run together of diaper changes, sweeping, laundry, potty training, cleaning up the same toys fifty times a day? And yes, I do hear how whiny and petulant I sound right now. It’s probably just the exhaustion speaking. Because I know so well that there are lots of women who would gladly trade places with me. I know the sadness of leaving my child in someone else’s care while I go to work, all the while wishing desperately to be able to just stay home with them. I know how wonderful my hard-working husband is and how blessed I am to have a happy marriage. I know how truly amazing it is to have four healthy children. But that knowledge doesn’t make the long days any easier. It just makes my mommy guilt worse. 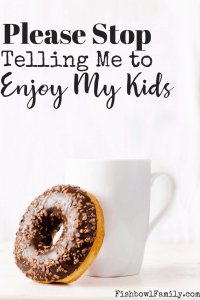 So, please stop telling me to enjoy my kids. Instead, tell me that it’s worth it. Tell me about the time that your kids spilled maple syrup and powdered sugar all over the aisle and you were so embarrassed, but now you all laugh about it. Tell me about how that wild little boy is a high school football coach now. Tell me that your unbelievably sassy daughter is an excellent lawyer that loves Jesus. Tell me that you know how I feel and that it’s okay. Tell me that God used your failures for your kid’s benefit and His Glory. Tell me that I’m doing a good job. No, tell me that I’m doing a great job at the hardest job and that someday it will all matter. Because there are some days that it feels so fruitless. There are days when my kids are horrible and mean and disrespectful, and it feels like I’ve done everything wrong and that they will all end up incarcerated. I do my best to find joy in the mayhem and to recognize how fleeting childhood is. I have my morning quiet time with the best mom devotionals I can find. I pray non-stop all day long. I’ve got Jesus on speed dial I’m calling on Him so often. I pray with the kids and for the kids and over the kids and, honestly, put any preposition you like between “pray” and “kids” and I’ve tried it. I’m doing all the things that I’ve learned from the Bible and blogs and real advice and I still feel like a failure most nights when I go to bed. So please stop telling me to enjoy my kids. Everyday I look at them and marvel that God chose me to be the mother of these amazing little people. We laugh and play and cry and eat and love and serve and live together all day long. Because we homeschool even though I often hate it. That’s why we’re at the grocery store at 10 am on a Monday. So when you catch me at a bad moment in a tough situation, tell me something encouraging. Tell me I look great in yoga pants. Tell me you thought I was a nanny because I look too young and well rested to have four kids. Tell me the kids are cute, and I might just let you borrow one for a bit! But enough with the forlorn counsel – stop telling me to enjoy my kids. Because right now, I cannot imagine that I’ll ever miss the chaos of a grocery shopping trip with four kids under ten years old. I think I’ll be as likely to miss the unsolicited advice. 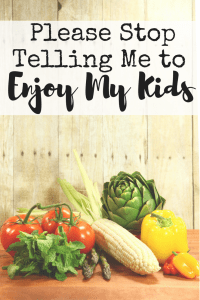 Have you ever had someone tell you to enjoy your kids? How do you respond? Tell us in the comments! I love this. You encapsulated motherhood so perfectly in this post. Yes motherhood and having small children, it’s a blessing, but it’s such a hard stage of life. Thanks for sharing. Thanks Hailey! (Awesome name btw 😉). I love the way you put it – it is a blessing AND a hard stage of life. I think people often think all blessings should be easy. I know my four little blessings are quite a handful! This! So much, this. I am dying of laughter right now. I think we should print this and hand it out when those sweet little ladies approach us in public. You’ve hit the nail right on the head. No more backhanded mommy guilt. More encouragement! Amen! I.LOVE.this! Yes! Thanking you for saying all I’ve wanted to say over and over again! Yes Yes Yes! I have the same thoughts, but I SO love the “instead” turning point of this post. We’ve all experienced that advice, and while we get it…we just want to get out of the store. Oh, and “you must be the nanny’…HAHA! I love that. Amen this post made me smile. My children have gotten older, ages 14, 11 and almost 10 but I can so appreciate this post because I’ve totally been there. I appreciated this so much. I heard it so much when my kids were little, “Enjoy them because they grow so fast”. I vowed never to.say that to a young mom. I say things like, “I love to see how much you’re enjoying your kids”, or “You’re a good mom” and even, “You look like you’re having fun”. Well now my kids are grown and moved away. I’m at the stage I used to dread every day while enjoying the wonderful and the frustrating things about motherhood. I love to think about those days but i find joy in now. My new season. God had a plan for me to raise them to make a difference in their world. And now He’s chosen something different for me that fulfills me. Oh, this is so great! You almost had me in tears with your gut wrenching reality. We ALL need to hear those encouraging words!